Sister Eileen Reilly, SSND, and the delegation attending the UN-CSW review some of the previous sessions on UN Web TV. The School Sisters of Notre Dame delegation attending the United Nations Commission on the Status of Women used their “snow days” to review the meeting agenda, examine the Sustainable Development Goals and prepare for their advocacy efforts on behalf of women and girls. 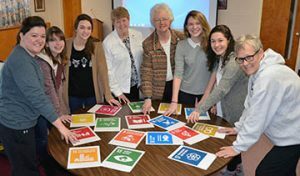 The group of students and staff from SSND-sponsored high schools met with Sister Eileen Reilly, director of the SSND UN-NGO Office; Sister Kathy Schmittgens, coordinator of the SSND international Shalom office; and Sister Ethel Howley, the first SSND representative to the United Nations from 1993-2002. “One of the things I really liked about being at the United Nations was that there were people from all religious traditions and backgrounds working together to abolish war, eradicate poverty and preserve the planet,” Sister Ethel told the students. This month at the UN-CSW, the theme is women’s economic empowerment in the changing world of work. It’s the recognition that if women are truly going to be equal, they have to be equal in the world of work, Sister Eileen said. 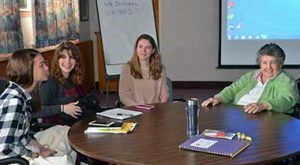 Sister Ethel Howley (right) talks to students Maggie Meystrik, Joey Wagner and Maddie Tewey about her experiences as the first SSND representative to the United Nations. Looking over the U.N. Sustainable Development Goals. From left: Notre Dame High School (St. Louis, Missouri.) Admissions Director Katie Mallette and students Joey Wagner and Maggie Meystrik; Sisters Kathy Schmittgens and Eileen Reilly; and Notre Dame Preparatory School (Towson, Maryland) students Maddie Tewey and Elena Benassi and teacher Gail Caltride.